The sunburn on my nose and forehead has begun to peel. No, I did not go to the beach. Who would go in this weather? We had so many things planned for that weekend: maybe a barbecue lunch, dinner out to a fancy resto, a movie, some errands perhaps, or a relaxing massage - but our weekend activities was decided for us instead by Ondoy. 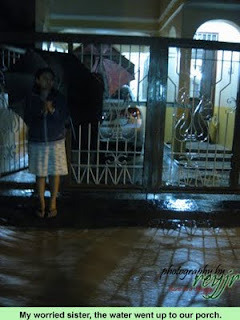 I wanted to sleep-in that Saturday morning (I drove home from Batangas the night before) but was woken up early by my worried girlfriend Liz: her sister Belle lives in Pasig too, and the flood in their area is rising fast. My dad and I had a quick coffee and tried to make our way to Belle's house. One of my Uncles volunteered to drive my Lolo's Tamaraw FX for us - we needed a high enough vehicle. The traffic was horrible. When we finally reached Ortigas Extension via East Bank Road, the FX could no longer move forward because there was already about a meter deep water. Even on foot, the water was already too deep to traverse. We saw one vehicle being pushed across - it was the only one that tried. We went home and decided to wait it out until the water went down. Anyway, we knew Belle was fine, their building had 3 floors and all that. Little did we know our troubles had only begun. When we went back again after some lunch, the water had not subsided...and it even increased. We were stuck on East Bank Road and there was no way to get onto Ortigas Extension without swimming through waist deep water. We talked to a few people and they told us that the water further up Ortigas Extension went up to about 12 feet. No one was going to take us across. 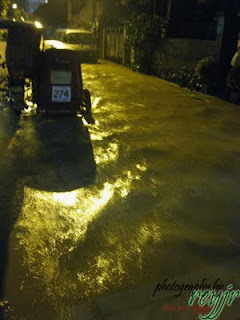 When turned into our street, the water had risen to knee deep. Our lucky street which has never ever flooded before is now a river. Plant boxes, basins, shoes and slippers, and other items were floating down our street. The water level was rising fast. It was the cockroaches that got to me. They were trying to find higher ground much like we were, and they chose to go to our garage. How many cockroaches have you seen flocked together like flies on a wire? There was more than a hundred cockroaches there on our hose, on the walls, on the faucets. As early as Saturday afternoon, Liz had already lost contact with Belle. Belle, who just had a C-section about a month ago when she gave birth to Baby Johann was alone. Her husband was at work with their other daughter, a 3-year old girl, and the Yaya was on a holiday. When the flood water began rushing inside their apartment, she picked up the baby and called her husband on the cellphone. Minutes later, she barely managed to switch off their electricity, grab the baby's things and her office laptop before she ran to the 2nd floor of the apartment building. The water rose too quickly for her to save anything else. During the whole ordeal, she was not contactable, the landline phones were out, the cellphones had very little or no signal at all, the electricity was cut, they had no change of clothes, and they had very little food remaining. We were worried sick about what could have happened. It was on Sunday that my Dad and I finally got onto Ortigas Extension and saw for ourselves how deep the flood really was. After paying P50 each for a pedicab ride across the still waist deep portion of the flood, we found ourselves amidst hundreds of people on the Floodway bridge. A lot of them were dry - people on their way home but got stranded because of the flood. They were mostly worried about their families, some more vocal than others. There were also some obviously wet people - those that braved the flood and swam across the 12-ft deep water. Optimistic that Belle and her baby had already been rescued, we checked Rosario Church to see if they were brought there. But they weren't there. There was no evacuation area there at all. We walked back again over the bridge and to the edge of the water hoping we could find a way to get across. It was on the way back that it happened - there was a commotion, people were running, some screaming. Four or five men arrived carrying a body. The man was unconscious and they were trying to revive him. "Nalunod!" (He drowned! ), said one man. "Bigyan nyo ng hangin! ", (Give him air! ), said another. I stood there paralyzed. Was someone giving him first aid? Mouth to mouth rescuscitation? I did not see. I wanted to help but I felt helpless. Did they tilt his head back? Did they pump his chest the right way? I tried to assure myself that they were trained professionals. And still I was overwhelmed with frustration. We found Christian, Belle's husband, at the edge of the water. He left their 3-year old at a friend's house and commuted/walked his way there. My dad needed to leave - he had to catch a plane. We waited for rescue, standing in knee deep water under the sun. It had stopped raining, but I was worried for those stuck on their roofs with the now scorching sun making it even worse. The Coastguard, the Navy, the Marines, the Army, the PNP, the Philippine Red Cross - they were all there but they were helping the majority. We couldn't get anyone to help us. They tried to assure us that Belle and her baby was safe, convincing us with logic - yes they have a 2nd floor - but in this situation, logic takes a backseat. No, we can't contact them, we are not sure that they are safe. Belle's brother and his wife also arrived to see if they could help any. But all we could do was wait to rescue. It was around 2pm when we finally found someone willing to help, but they needed directions to another place first. We looked for Christian but couldn't find him. Oh no. Did he swim across? We got even more worried. During that long wait, every hour or so they would pull out another body from the flood. People are drowning. He panicked. He waded in the flood up to his chest and convinced one of the boats to let him ride. They wouldn't let him. He finally found one who let him stay, but only up to the main street. They gave him a lifevest instead - the one that saved his life. Christian can't swim, you see. But he needed to get to his wife and baby. He floated and paddled towards his house careful not to swallow any floodwater. The devastation of Ondoy was tremendous - whole houses were submerged in water, cars were floating around, and there were bodies - dead bodies floating on the water. He continued, determined to get to his family- then he felt a pull - he was being sucked in by an open manhole! He went underwater but managed to fight and with the help of the life vest, he got away. Christian finally got to Belle and managed to send us a text message for the signal from his phone was cut too. They were safe. Their neighbors shared food with them, so they have food. They were dry. Thank God. By the following day, a Monday, the flood had already subsided on Ortigas Extension. It was passable by light vehicles. Belle and Christian, was reunited with their 3-year old daughter, and with baby Johann. By the grace of God, they were all safe and sound. In the aftermath of Ondoy, Belle and Christian and their family are still struggling with the loss of their home, their furniture, appliances, personal and legal documents, clothes and even photographs. If you would like to help them rebuild their lives, any donation will be much appreciated. If you would like to send donations directly to Belle and Christian, you can use my Paypal account below or on the sidebar, OR send me an email at reyjr.rombawa[at]gmail[dot]com for Belle's bank account number. My prayers go out to my friends Tudoy, Cille, KJ, Bay, Mei-an, Des, Reagan, Glady, Quennie, and their families, I'm glad you are all safe. Hopefully we all recover quickly from this. For everyone, if you have more than enough, please share. Help by donating through these venues. Read more Ondoy stories here.